Professor Luz Nagle specializes in international law and international criminal law at Stetson University. The Hispanic Bar Association honored Stetson Law Professor Luz Nagle on Nov. 2 with the E. J. Salcines “Spirit of Tampa” Award. 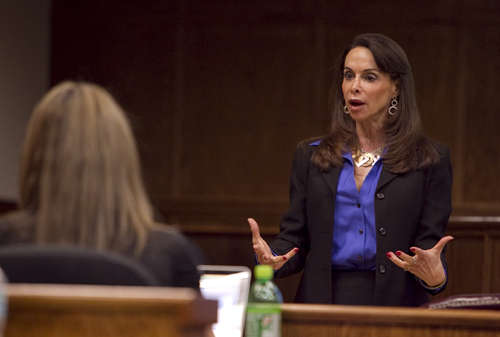 Professor Nagle is the first tenured Hispanic law professor at Stetson University. An expert in international law, international criminal law, national security law and human trafficking, she has been a lecturer and visiting professor, training students, lawyers and professors around the world. Professor Nagle’s career prior to teaching included serving as a judge in Colombia confronting drug lords and pursuing software pirates as a member of Microsoft Corporation’s Latin America Copyright Enforcement Practice. As a professor of law at Stetson University, Nagle has met with visitors from across the globe as part of the State Department’s Distinguished Foreign Visitors Program. Active in several bar associations, Professor Nagle has served on the International Bar Association task forces on terrorism, corruption, criminal justice reform, and combatting human trafficking. The E.J. Salcines Spirit of Tampa Award honors Judge Salcines and celebrates those members of the community who mentor, guide and pave the way for young Hispanics in the Tampa Bay area. Judge Emiliano Jose Salcines served as a prosecutor and in private practice before he was appointed to the Second District Court of Appeal in 1998. He has been an active participant in the Tampa legal community. The Hispanic Bar Association recognized him for his years of service, and established the Salcines Spirit of Tampa Award as a tribute to his involvement in Tampa over the last 40 years.